After reading over my last blog, I realized I had not begun to cover Duchess' life. She was in mine for 34 of her 36 years - through raising my family, my children growing up and leaving home, two marriages, a divorce, and several moves. That's a whole lot of time and history. I bought Duchess (registered name Ma Dear) in Montana and named her immediately. She was a grand lady. She would have a grand name. She lived up to it. Since Duchess was bred to race, I sent her to the track the spring after I bought her. She performed very well winning 2 firsts, 1 second, 1 third and 1 fourth (didn't like mud!) from five races. The photo below is her win in High River, Alberta. When we brought her home from the track, I bred her to War Fly and sold the weanling to re-coup some of the expense. Then I started training her on barrels. As noted in the previous blog, she excelled at that event. Besides her stellar barrel racing career, Duchess performed briefly as a steer wrestling horse for my brother. I think he won one cheque on her from the 3 or 4 times he dogged off of her. 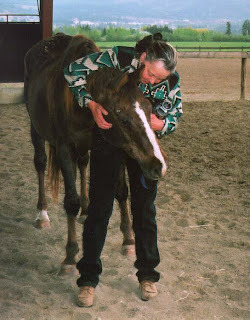 She also served time as a ranch horse on the Community Pasture my husband managed. 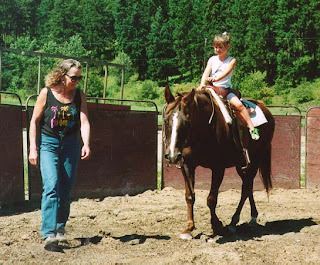 And my daughter, Cindy, rode her until she had her own horse. Duchess raised seven foals. 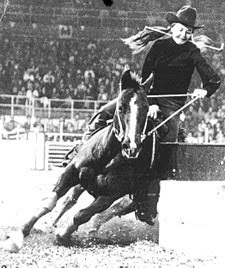 One, Wildwood Willow, went on to become a top barrel horse. Another, Wildwood Majesty, a superb all-around mare. But it was Wildwood Mahogany who would carry Duchess' genes to the next generation and beyond. It was a sensible, logical and practical approach to my plan to breed such soundness of mind and limb into my future contenders. At thirty plus years, Duchess was more sound than some horses half her age! Video below is Duchess at 33. In 2001, I held a 35th birthday party for my lady. Here is some video from that day. Bright of eye and quick of step, she was not-at-all an old mare - she was a grand dam. Then, in 2002, she reigned supreme for she was the head of five generations. Here is another video of Duchess that year - the grand matriarch of a dynasty of fine Quarter Horses. She leaves a legacy - and Widwood Legacy is named for her that year, the year she died. Legacy will be adding to the dynasty in 2011 - the first of the next generation of Duchess. Though Duchess may be remembered by others for her talent, I remember her most for her personality - her quiet confidence, her intelligence, the way she looked at me like she saw me and understood everything about me. She had a distinct way of looking back at me - she turned her head, neck very low, and kind of looked in and up - hard to explain. And her whinny... deep-throated and resonant, never shrill. I have a recording of that whinny. Once in a while I play it. If I could, I would share with you but I don't think I can attach the file. When Duchess died, my children could not believe she was gone. She had been part of their lives for all of their lives. I knew how they felt. In could hardly remember a time when Duchess was not in close proximity. I still miss her. The Canadian Finals Rodeo is just over. I tried in vain to find coverage on television but, since I could not, contented myself with whatever news I could find on the computer . . . and memories. I have fond memories of CFR - Duchess and I competed at the first one in 1974. I will never forget that week . . . or that great mare. I had ran on the circuit all year to make the barrel racing top ten in Canada and go to the finals. Goal achieved, it didn't matter to me if I made any money. I was just happy to be there. Duchess had already secured the Canadian Cowboys Association championship; now she would compete with the top horses in Canada. It was an honour to be part of what still is an annual event. Duchess was not at her best, though. A sporadic lameness in her right front concerned me. Before I hauled to Edmonton, I had a veterinarian check her out. He did not think competing would make the condition worse (what was I thinking?) so, armed with lots of rubbing linement and bandages, I hauled to Edmonton for six runs. She entered the finals in seventh place and finished in fifth - with her knee bandaged! The photos from all six runs were almost identical to the one below, right ear ahead, left ear back to me and in the pocket! After the CFR, I took Duchess to Saskatoon to have her knee x-ayed. The x-rays revealed bone chips and calcium deposits. I had to lay her off. I turned her out for a year and she came back sound. Although I barrel raced her lightly for one more season, I feared heavy competition might damage the knee permanently. In 1977, I bred her and she went on to found a dynasty of quality Quarter Horses. The photo below, taken in 1999, shows Duchess with her daughter, Mahogany, granddaughter Tamarac and Tamarac's first six fillies. After Duchess retired from raising foals, she babysat the broodmares and their babies. She always told us when a mare's time was near. She also taught my grandchildren to ride. Below is a photo of Kendra on Duchess when she was 32. When she was 35 years old, I threw a birthday party for her. She was still sound. The photo below is taken on that day. In 2002, four descendent generations of Duchess lived with me - Wildwood Mahogany, Wildwood Tamarac, Wildwood Destiny and Wildwood Magic Miss, all mares I had trained and shown. For her 36th birthday present that year I made her a memory box and stored Duchess memorablia inside. It's covered inside and out with a collage of photos and clippings. She died later that year, but what a dynasty she has founded. 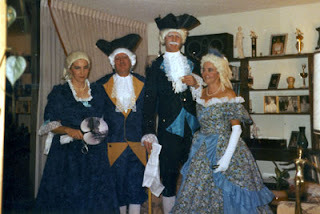 The photo below, taken in 1999, shows some of her family. Duchess and Mahogany are at the back. In the spring of 2011, the next generation will arrive. Her great-great granddaughter, Wildwood Legacy Lace is in foal to Walking With Wolves. God willing, I will ride another descendent of probably the best mare I ever owned. I can't wait. A few weeks ago, I posted a blog named "Born to Be" (September), recognizing people with incredible God-given talent. Born to be great. Born to be the best. Born to achieve what the rest of us only dream about. As humbling as that is, it's even more so when the star is an animal. Never has this been more true than it is for Zenyatta, a six year old Thoroughbred mare with almost unbelievable talent. 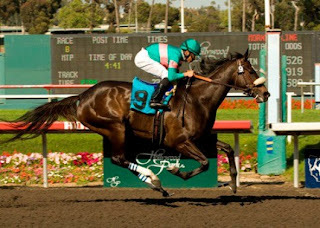 Zenyatta, unbeaten for 19 races and entered in the Breeders Cup held last weekend, has inspired a following such as has not been seen since Seabiscuit (check out March blog). The world has latched on to her story with a desperation born of a need to believe and a deep abiding love of this dark bay mare, not only for her record on the track, but also for her personality. At 17.2 hands, she is a bit of a diva, dancing, prancing, and racing her way into almost everyone's life, even those who do not follow horse racing. She loves attention and believes in herself, inspiring such nicknames as "Queen Zee" and "America's Darling". 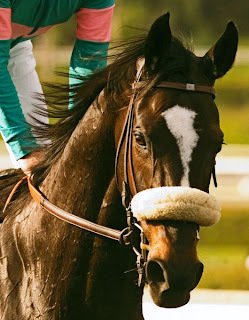 Last Saturday, Zenyatta challenged the boys in the Breeders Cup Classic in Louisville, Kentucky. Surrounded by fanfare and guards, she soaked it up like the heroine she is. There could be no doubt she knew who she was and what she was going to do. There was also no doubt in my mind that she intended to win the race, that she herself had no doubt about her ability to do just that. After all, she had always led the field to the finish line. But it was not to be. After an extremely slow start, even her signature "kick" to the finish line did not overtake Blame. Slightly boxed in, she desperately searched for a hole and when she found it, leaped into it, grabbing ground and closing the gap to the leader with every stride (with thousands, including me, screaming their encouragement to the telvision), only to fall short by a head. It may have been the best race of her career, the most courageous and most remembered. Best of all, she will retire sound and healthy. I hope Zenyatta is not too disappointed with her loss. It in no way diminishes who she is or who we know she is. She may not have won the Breeders Cup Classic, but it was hers! Second in the race but first in our hearts. As a child, in the Coteau Hills of Saskatchewan, I did not go "trick or treating". When the family moved to BC, I went door to door in Oliver with a group of kids a few times. It was as an adult that the spirit of Halloween really hit me. My husband, having grown up in a family that loved the "trick" part of Halloween, involved me in a couple of pranks - saddling a milk cow (I was sure we were going to be caught since the dog never quit barking! ), jacking a car up in a garage and putting it on blocks (so it would not go anywhere when the lady tried to drive it out). The most complicated - and stupid! - prank I was part of though, was when a carload of us, in the dead of night, drove to a farm owned by a farmer friend that was well-known to "act first, think later". The plan, to spread out all over the farm, make just enough noise to wake him, hide, then watch the reaction, took an unexpected turn when one of our group came back to the car, got the shotgun he had stashed in the trunk, pointed it to the sky and shot it off! It was double the fun, a trick on the tricksters - the farmer boiled out of the house, into his truck and peeled rubber getting to his machinery; the pranksters, thinking it was the farmer who had shot the gun, panicked. They certainly popped out of the grass so they wouldn't get run over. When shotgun pellets dropped to earth all around my husband, he didn't seek obscurity any longer. He ran to the house and identified himself to the farmer's wife. The farmer, meanwhile, reached the car but the bearer of the shotgun had put it away. Where was I in all this? At the car. I think I made the excuse that I was not dressed for crawling around on the ground, but I may have just been chicken... Since we were all friends, we ended up in the house for coffee. There were plenty of unaswered questions and no one quite believed the other guy since no one knew where the gun shot had come from except the guy who had done it and me, because I had stayed in the car. I think he had the last laugh that night. As I said, this was a really stupid thing to do - someone could have been run over with the madman farmer, gas pedal to the floorboards, made wide circles in the field! As the years went by, I left the pranks behind for costume parties. 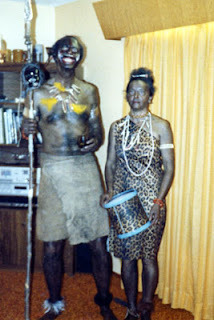 My boyfriend and I were Shiek and Harem Girl, African Headhunters and 17th Century Lord and Lady.The best ever was the Africans. We visited a couple of bars, then danced our bare feet off at the local dance. At 3:00 AM, I could barely stand in the shower to scrub the "black" off before I went to bed. The next day a client phoned to see if he could watch me ride his mare (like I felt like doing that!). He said he could see traces of black on my neck still. The last time I dressed up for Halloween, Vern Sapergia, my friend Barb, and I dressed as Little Red Riding Hood, Grandma, and The Big Bad Wolf. Vern Sapergia was Little Red Riding Hood! We visited several friends around Armstrong but never identified ourselves. Sorry - no photo. I tried, but apparently I did not have film in the camera. What a shame!